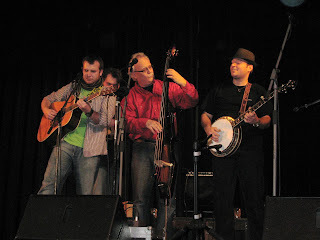 Our indefatigable correspondent Lilly Pavlak reports on the third major event she attended recently in the Czech Republic. 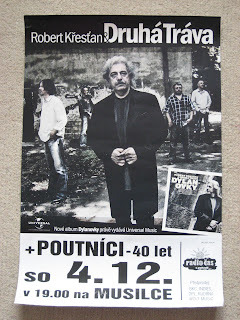 Having covered the 20th anniversary of Monogram and the 20th anniversary of Folk magazine, she attended the concert in Brno marking the 40th anniversary of the highly influential, award-winning band Poutníci. 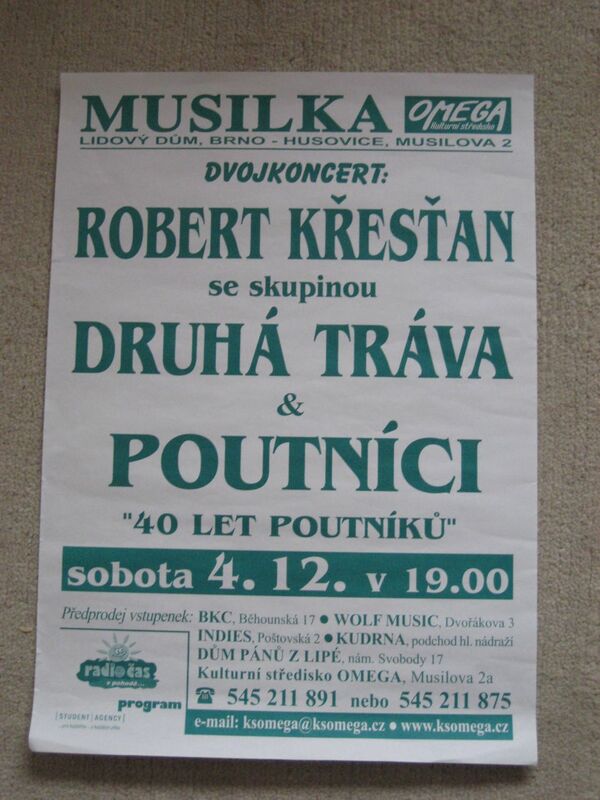 Robert Křesťan and Lubos Malina of Druha Trava are former members of Poutníci, so Druha Trava opened the concert, followed by Poutníci in its present lineup (above). 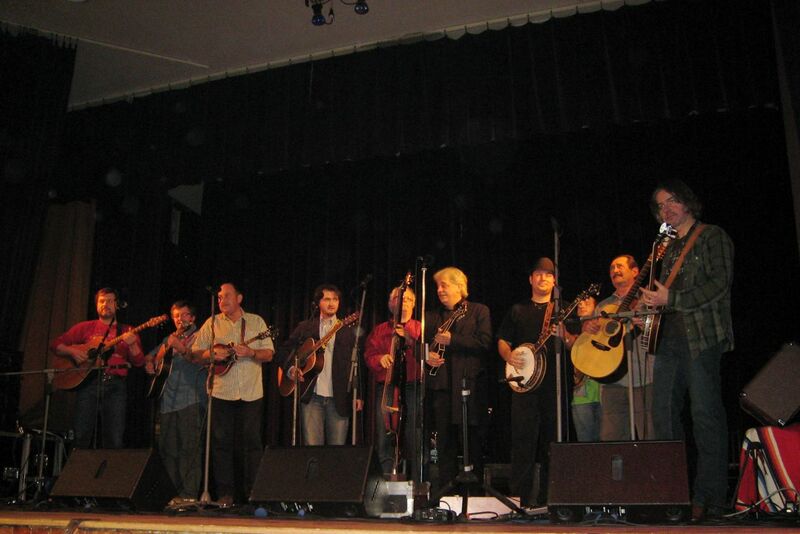 The finale (below) combined all past and present members. 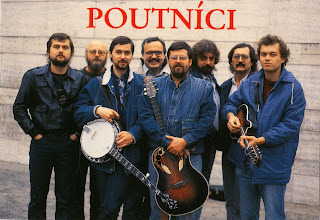 During their forty years, Poutníci have recorded twelve albums, played more than 2000 gigs, and appeared many times on TV and radio. 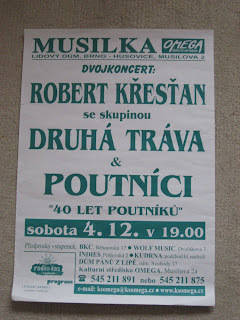 They have sold over 100,000 copies of their music on the Czech market, have often played abroad (Austria, Poland, Russia, Switzerland, etc. ), and performed at the EWOB Festival in 1999, the first year in which it was held at Voorthuizen. Above, Poutníci c.1990: Mirek Hulan, Pepa Prudil, Lubos Malina, Jirka Karas Pola, Franta Linharek, Robert Křesťan, Zdenek Kalina, Jirka Plocek. 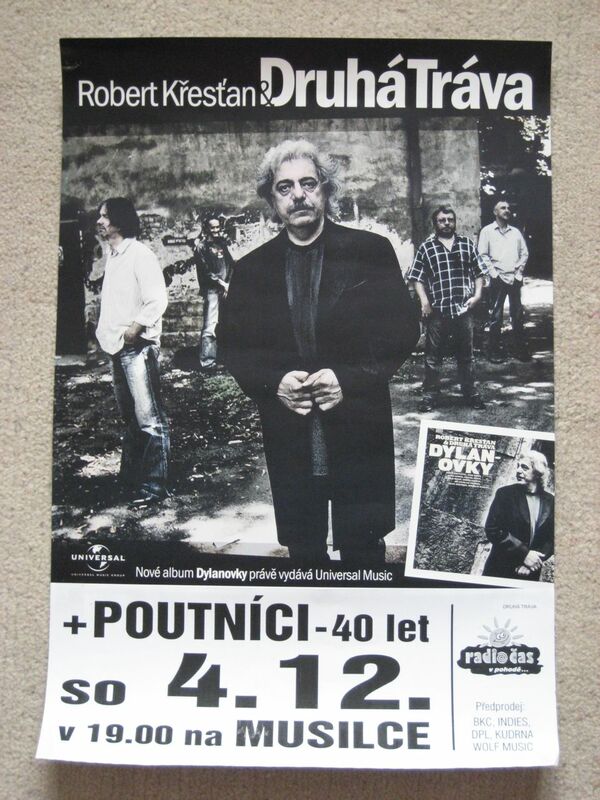 This lineup - the last before the formation of Druha Trava - won the SPBGMA award for the best non-American recording in 1989 and 1990, with 'Wayfaring stranger' and 'Chromi kone'.